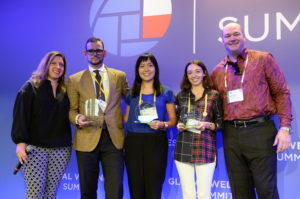 The winners of the 2018 Shark Tank of Wellness global student competition have been announced! Congratulations to Maria Mu of Cornell University for her sleep technology concept, Bellumo, aimed at helping hundreds of millions of people worldwide that have trouble falling asleep at night. Thank you to the students and judges for participating! Read the press release. Students are to submit a future-focused, innovative wellness idea, product or service that has the potential to become a profitable business venture. Each individual or team is required to submit a Concept Submission Form in addition to a one to two minute video. The Concept Submission Form consists of several questions on details of the idea and its viability. The video should include a presentation of the idea, focusing on why the innovation could positively impact the wellness industry and how exactly it could become a viable business. Wednesday, June 1, 2018 (12:00 pm GMT): Competition Closes. Late submissions will not be accepted. Wednesday, August 15, 2018: The top three concept submissions, as decided by the judges, will be announced. 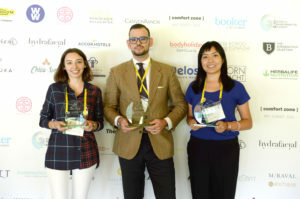 Arrangements will then be made to fly each of the top three student finalists and the professors working with them to Cesena, Italy for the Global Wellness Summit, October 6-8 at the Technogym Village. 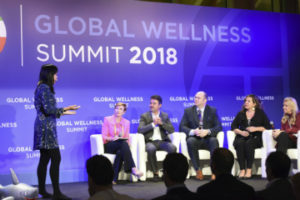 Monday, October 8, 2018: The “Shark Tank of Wellness” Finalist’s Competition will take place on stage at the 2018 Global Wellness Summit, in front of the audience of delegates and the “Wellness Shark” judges. The first-, second- and third-prize winners will be announced on-stage later in the afternoon, at which time the prizes will be awarded. The winners will be listed on the Global Wellness Summit website and promoted on social media post-Summit. 1. REGISTER for the contest online: Anyone interested in participating in the competition must register by completing the Entry Form. Contestants will receive regular updates by email regarding the competition. Still have questions, check out the Shark Tank of Wellness FAQ’s here. See 2017 and 2016 Shark Tank of Wellness Top Finalists here. and quality of the project presentation. For any additional information, please review the Shark Tank of Wellness FAQ’s or contact Kate Sornson.